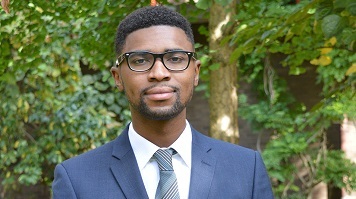 Robert Narteh spent his placement at LSBU’s in-house Legal Advice Clinic (LAC), which involved working face-to-face with clients and providing general advice under the supervision of qualified solicitors. Generalist advice includes social welfare areas such as housing, employment, family, benefits and taxes. Where appropriate, the students signpost and refer clients to local advice agencies and other legal services such as solicitor firms. Clients can also be referred to the clinic’s evening sessions. During these sessions student shadow volunteer solicitors from local law firms who provide specialist legal advice in areas such as family, housing and employment. The clinic is based at the Clarence Centre, 126 London Road; with term-time opening hours. There are three interview rooms and a resource room, and the clinic has so far helped more than 2,000 clients since opening in September 2011. The daytime public drop-in sessions are staffed by student clinic volunteers under the supervision of qualified solicitors and the clinic director. Students work in pairs when interviewing clients and under supervision to give generalist advice, make referrals or refer clients to the evening sessions. “As students, we are divided to work in teams of two under the supervision of a qualified solicitor. We conduct interviews with drop-in clients by taking notes and assessing the legal issue and what the client want to achieve,” says Robert. “The interviewing stage is divided into two stages. The first part consists of fact-finding by interviewing the client and asking appropriate questions and establishing the purpose of the client’s visit. Following this, we pause and go to the resource room to research the enquiry under supervision. We return to the interview room to give feedback on the advice researched. At the end of the interview process we write up an accurate case record of the client enquiry and the advice given. “My expectations at the start of the placement were to gain practical legal knowledge of the law, understand the principles of client care and the legal professional ethics as they apply to the law and civil matters. Also, I wanted to improve my legal professional skills such as interviewing, research, drafting, and client advising skills. My expectations were definitely met. Before beginning the work placement two compulsory training sessions were held, the aim of which was to prepare students for work at the clinic. The training covered working with clients, case recording, client confidentiality, interview skills, information resources, signposting and referral, the client pathway main enquiries and specialist areas. Robert’s work at the clinic covered different areas of law, including housing, family, employment, benefits and taxes, and he says that completing this variety of cases provided him with a real insight into range of legal support and advice people do require. “Most of the housing cases I did involved illegal eviction cases, with one involving an apparent illegal eviction by a resident landlord. I learned through research a lot about this area and discovered how the law tends to protect a resident landlord from a non-resident landlord. Other cases involved unfair dismissal, discrimination and associated discrimination." "We explored the rights of an employee to make a claim to the Advisory, Conciliation and Arbitration Service as well as making claims to the employment tribunal where a client thinks they have been treated unlawfully. I also dealt with cases where we explored the ACAS free early conciliation service. Another case involved helping a client fill up The National Police Chief’s Council (NPCC) application for a record deletion form following an apparent wrongful investigation from the police, which led to the client’s DBS certificate being marked with a criminal offence." Robert believes that his time at the LAC has taught him very useful life lessons as well as providing a clearer understanding of the difficulties that the profession poses to the mental state of a person when they have to deal with sensitive and, at times, heart-breaking matters. “I have learnt the importance of having people skills. Clients who comes to the clinic are often in a fragile and desperate state and in need of help and support. Knowing how to spot those situations is key for a smooth and positive outcome of the interview. Professionalism is required when dealing with clients. Emotions should be set aside and must not interfere when conducting interviews." "I developed the ability to assess clients by asking the most relevant and efficient questions to better address the issue at hand. I also learned how to provide generalist advice and what steps to take, in terms of research, when faced with a legal problem, as well as how to identify the relevant sections of an act and apply them to client problems." “On my work placement application, I specified the importance of this work opportunity. The clinic experience gave me the opportunity to work under the supervision of qualified solicitors, which helped improve my legal practical skills. I got the opportunity to work face-to-face with clients and deal with real-life problems. I gained a further understanding of the legal environment, researching and how to advise clients on legal matters. This provided me with the necessary experience and the right motivation to keep working hard for my career goals."